With the prevalence of data available in today’s wired world, it is becoming increasingly important that we know how to manage that data and do something useful with it. 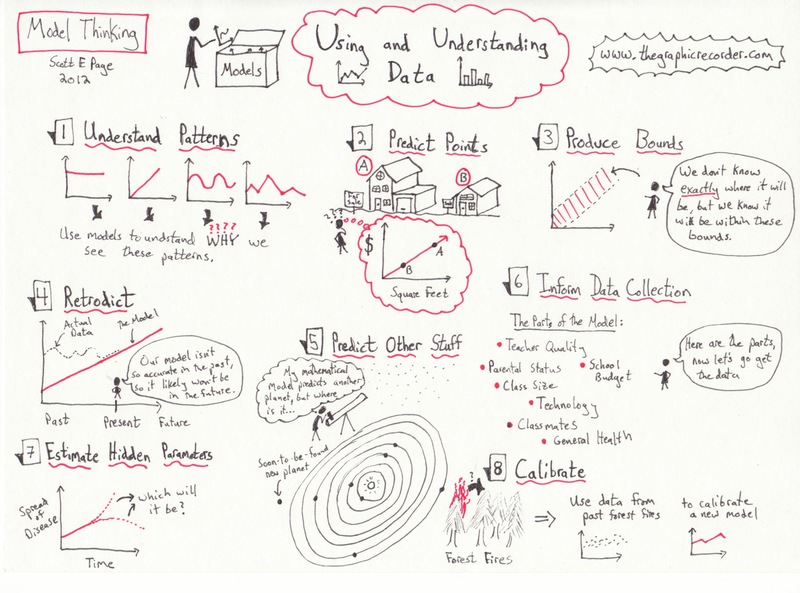 In this lecture Page discusses how models can help us to use and understand data. Of the eight ways to use data that Page discusses, the one that interests me the most is using data to understand patterns. In this post I will delve a bit deeper into that applications. I am particularly interested in the ability to understand patterns from an educator’s standpoint. As a physics teacher I have tried to develop a curriculum that teaches students the skill of understanding patterns. I am a huge proponent of students doing real science in the classroom, rather than simply reading about science in a textbook. But many students are not accustomed to regularly doing the work of a scientist, especially when it comes to dealing with data. So that is a skill set that we must teach. During my student teaching experience, I noticed that one hurdle that many students encountered was the ability to connect concepts learned in math class to the data that they gathered in the lab. Even students that are skilled at analyzing graphs in an abstract sense (y = mx + b, for example) may lack the cognitive framework to apply that same idea to a graph of position versus time for a moving object. In both cases, the underlying pattern is the same, but the why behind the pattern is context-specific. Only by understanding the why behind a position versus time graph will students to be able to take advantage of the useful applications of that model. I therefore believe that one of my roles as a teacher is to help students make that connection between the abstract graph (the model) and the actual phenomena that the model represents so that students can make good use of the patterns that are revealed in their data.